Surface water running off of the trail at this low point in the trail grade caused soil erosion threatening to undermine the asphalt. Many creeks and drainage ditches cross the Pumpkinvine Nature Trail are often unnoticed because they flow under the trail through small culverts. 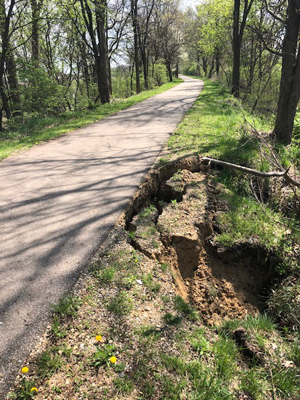 Sometimes the culverts are at low points in the trail grade causing rain water to gather at the culvert and flow into the drain ditch at that point. The heavy rains this spring eroded the soil around a culvert between County Roads 1000 and 1100 in LaGrange County. The erosion threatened to undermine the trail. In mid-May the asphalt above the the culvert was removed and the culvert was repaired.